TIGER PRIDE AND CONSISTENCY, YES! It was an absolutely perfect day for a stroll on an island beach and even more outrageous day for a football game on UPEI’s campus. 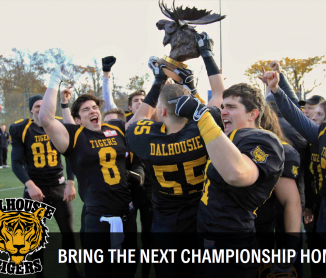 The Dal Tigers kept their hopes alive for an AFL championship repeat with as an exciting, hold your breath win over Holland College. Tiger pride and the most consistent half of football of the year, saw the black and gold come from behind twice, to defeat the maroon and white 21-18. Pre-game, Dalhousie head coach, Mark Haggett said, “we’re ready to go – best I’ve felt all year”. There are a lot of sport cliches: leave it all on the field, what a difference a day (week) makes, any given Sunday (Saturday) and they all and more applied to our proud Tigers, especially in the second half. The Hurricanes second possession saw starting QB Brady Crowe, hit Tyler Majuary for Holland’s first major. Brennan Davis, the one man wrecking crew from Dal’s 24-1 loss the week before, kicked the PAT. He continued scoring on a short FG and a punt single, to have the Hurricanes up 11-0 at half time. But the way the half ended was anything but normal! After a short Dalhousie drive which saw a 20 yard completion negated by a penalty, the Cats went three and out at the HC 40 with over a minute remaining in the half. The Hurricanes would try to score again before duration but Gordon Brown’s INT and a fine run back concluded in chaos in front of the Dal bench. The field was littered with flags and officials’ hats in the scrum. Dal protested the sideline hit and a Tiger coach was two-handed by a HC player. When all had cleared, the Hurricane player had been ejected, three objectionable conduct penalties had been incurred by the home towners and Holland would be first down and unbelievable – about seventy! The play had started with a Tiger offside, therefore nullifying Dal’s possession on the pick. The Hurricanes kneeled twice inside their ten to end the half. During the intermission, Mike O’Grady, the president of the football club, was heard to say, “We have never been accused of having homer officials”. This wacky incident and an excitable Tiger half time locker room, as coaches and players tried to rally the squad for the do or die second half. Was this the turning point? An exciting third quarter was about to start. Dalhousie had won the opening coin toss and had elected to defer. Their first possession of the second half was two and a punt but the defence would ignite the offence. A QB strip and fumble recovery, along with an interception on the following HC possession, saw the Tiger O shift into gear. Ryan Merlin’s eleven yard touchdown came on a pass from Chris Duplisea. Alistair Chauhan’s reception major from Duplisea and Merlin’s two converts gave Dalhousie their first lead at 14-11. Holland College’s onside punt strategy and Dal’s lack of being able to jam those two players, saw Cole Bridges give HC great field position on the recovery. Davis now playing QB, teamed up with Majuary for his second six from 26 yards out. Hurricanes 18, Tigers 14. The Dalhousian’s twelfth possession of the game saw a good size Tiger contingent up and cheering with their thunder sticks as Duplisea completed two long passes to soft-handed Chauhan to set up Zack Leger’s six. The College D had kept Leger pretty much to short gains most of the game but “smash and dash” dashed twenty yards to put Dal up for good. Merlin’s one, left the final score at 21-18. Special teams’ coach Burke decided to have Merlin squib kick the final two kicks to cut down on the long returns and they were successful. But there were some anxious moments during the last few possessions. On HC’s third last sequence, a huge sack by Jesse Legault forced Davis to punt and Dal gave up the ball on a fumble at their fourty-five. A knocked down pass and an incomplete pass saw Davis come up short on a 52 yard FG. On a usually windswept field, the flags were limp. The Hurricanes took over again on their 49 but three incomplete passes later, Dal’s dynamite D had assured the Tigers a return to the AFL’s championship game for the third consecutive year and a chance to win back to back titles. WE HOPE TO SEE MORE TIGER ALUMNI AND FRIENDS IN FREDERICTON ON SATURDAY!!!! Tiger Pride, O and D consistency, and fewer penalties will result in the VICTORY!